READY FOR A NAP JUMP INTO A COZY LOUNGE OR BOLSTER BED. 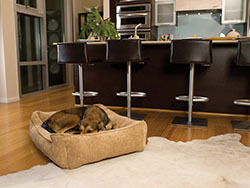 Designed like a sofa, lounge and bolster dog beds provides hours of cozy comfort for your pet. What dog could resist an inviting, low-profile dog bed with surrounding luxurious bolsters. These bed are favorites for dogs who like to curl or lean when they're ready to snooze.. Bolstered sides and center pillow unzip and their covers remove for easy maintenance. All covers are machine washable as are the center pillow covers.